On Easter Sunday, April 1, 2018, the Right Rev. 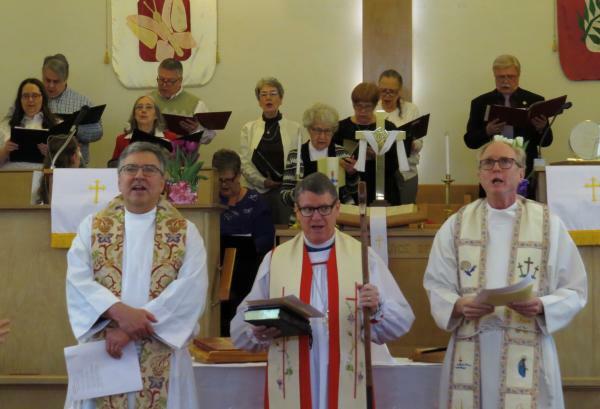 Jim Hobby, his wife, the Rev Shari Hobby, and over 100 members and friends came together to celebrate the birth of a new church— Reconciliation Anglican Church. The presence of God was very real—great energy and excitement filled the room, a unique vision was being birthed. It was the culmination of nearly one year of planning and a great deal of work by many people. All Saints Church in Rosedale, PA and St. James Anglican Church in Penn Hills, PA (two churches that were only 3 mi. apart) each came to an end and Reconciliation was born. The symbolism of life in the resurrection pointing toward the life of this new congregation could not have been more powerful, hopeful, or beautiful. Our story goes back to 2013, when several rectors, including Fr. Doug Sherman and Fr. David Rucker, proposed a merger of congregations. The goal was to combine the gifts and talents of several parishes into one church that would have the critical mass to truly reach our community. Archbishop Bob Duncan simply said “no.” His reasons made good sense, but “no” was hard to hear. But it is the bishop’s job to lead the church under the authority of God, even when the message is hard. Abp. Duncan did God’s work that day. What might have been disappointing then, we greet with thanksgiving today. Fr. David and Fr. Doug are certain the congregations were not ready nor called to “merge” in 2013. They now feel convinced failure would have followed. They were hearing a faint voice in preparation for something that had yet to come. It was not time and they thank God for a bishop that would not allow them to proceed. We thank God for Abp. Bob’s steadfast determination to do the right thing at the right time. Sometimes “no” is a great blessing, when offered in wisdom and love. By the first half of 2017, both congregations had come to the crossroads of some major decisions. St. James was facing the likely prospect of having to move for the second time in seven years. And All Saints was coming to a decision, to “replant” as a new church with a new name and more importantly a new vision and mission. It didn’t take long for the two rectors, close friends for many years, to acknowledge the possibility of “coming together.” As Bp. Jim lead and counseled both Rectors and congregations, he invited Fr. David and Fr. Doug to read Better Together: Making Church Mergers Work, with their leaders; and their book study informed the next year of conversations. Continuing conversations led to a joint meeting of the leadership of the two congregations in early summer 2017. That meeting set the parishes on a course that culminated on Easter 2018. The joy, energy, and excitement shared this past Easter morning did not come about automatically. Many steps were required to complete this journey. During the past year, months were invested in building relationships and common ground upon which to build a new church. There was uncertainty, sadness, and fear as the two parishes began the process of considering merging together. The process included spirit-led meetings and worship and an abundance of unity of vision between parish leaders. There were endless opportunities to be divided and go our separate ways, but the presence of God was always greater than the obstacles. By March 1, 2018, both congregations had voted to disband and to work together in the formation of a new congregation. All that was needed was a name. Both congregations were going through parallel processes to present acceptable names to the full body. Three names would be distilled from that work and presented to the bishop. Rules for the selection process were agreed upon. Options were considered and discussed freely, and three names were chosen. The next morning, during a 6:00am call, Fr. David and Fr. Doug surprised each other, each feeling uncomfortable with the selections and more specifically, the selection process. The two rectors agreed that the naming process needed to begin over. Originally, a name was sought that would “work” in this new culture. A name that would resonate with the unchurched - something that honored God, but was not “churchy.” The problem became obvious—everyone’s opinion was sought except for Jesus. The new process would be one of waiting upon the Lord, for Jesus to name His church. Less than two weeks before Easter, a new meeting was called once again to work towards a name, but from an entirely new perspective. Fr. Doug led the body through prayers, silence, and listening. Possible names were shared, some old and some for the first time. When it came time to consider our options, we were all led quickly to three names, one of which we knew was the Lord’s choice. We were not surprised Bp. Jim selected Reconciliation Anglican Church; it is the name God gave us. In the summer of 2017, God gave one of our members, Michael, a word for this new body: 2 Corinthians 5:17-20. As soon as we heard the word we knew this was from God. Since then, God has led us to understand our lives and ministry within the truth of these verses. We ARE a new creation, through Jesus’ work of reconciling us with God, and we are now ambassadors of Christ, called to carry the message of reconciliation to the world. Our very identity is completely wrapped in the name, as is the hope of the world and our new work. We are a new church, called to know Him, and follow Him and to love as He does—we are Reconciliation.